Do you want to have your own security camera system? Well, it’s possible for free with Dorgem, an open-source program for video recording. After you’ve downloaded the program you can use it to capture an image every few seconds. Also, if you don’t want the program to take that many images, you can also make it respond to motion with the motion detector. If the motion detector is on, it will only capture an image every few seconds for as long as it will detect motion. You can download Dorgem here at SourceForge.net. If you would like to read a tutorial or learn more about the program go to here. On October 2, 2008 Nintendo announced a new version of the Nintendo DS. The Nintendo DSi, as it will be called, will contain two cameras: one pointed towards the user (as a built-in webcam) and one pointed away from the user (as a camera). Also it will be possible to store data on a SD-card, which can be inserted into the device. Unfortunately the GBA-card slot will be removed, which will take away the device’s compatibility with GBA games and DS-accesoires which need an GBA-card slot. The Nintendo DSi will have its own internal flash memory and will ship with a built-in web browser. Pictures can be uploaded to the Wii’s Photo Channel. Also it will be possible to download games from an online store, called the DSWare Shop, and store them on the Nintendo DSi. The Nintendo DSi will first be released in Japan on November 1, 2008 for ¥18,900 (around $180) and somewhere around march for the rest of the world. EyeOS is a web-based open-source operating system. It’s free to use and you don’t need to download anything. 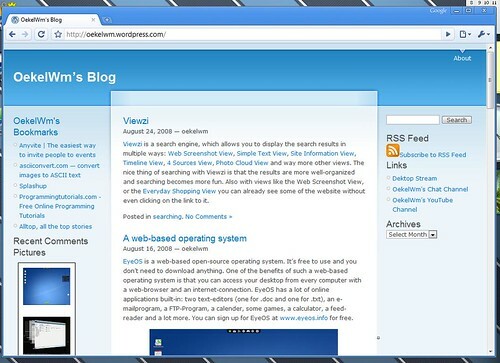 One of the benefits of such a web-based operating system is that you can access your desktop from every computer with a web-browser and an internet-connection. EyeOS has a lot of online applications built-in: two text-editors (one for .doc and one for .txt), an e-mailprogram, a FTP-Program, a calender, some games, a calculator, a feed-reader and a lot more. You can sign up for EyeOS at www.eyeos.info for free.